Bologna – destination for the greatest International conferences and events, thanks to the collaboration between Bologna Welcome and Bologna Congressi. The 69th Annual Meeting of the International Society of Electrochemistry has just come to the conclusion, a prominent event for the Italian MICE, that took place from 2nd to 7th September 2018 and had attracted over two thousand representatives coming from 55 different countries. 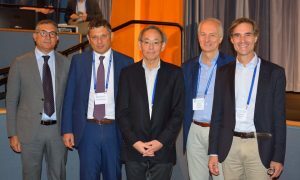 The prestigious event, that this year was held in the Congress Center of Bologna, consisted in six plenary-hall conferences, eleven award lectures, over fifty keynote lectures dedicated to the most recent achievements in the electrochemical research, as well as almost 2,000 oral communications and posters. Steven Chu, Nobel prize for Physics in the 1997 and former U.S. Secretary of Energy during Obama’s presidency, was the special guest of the meeting. Gianpiero Calzolari, the Chairperson of Bologna Fiere Group, states: “Thanks to Dr. Marco Musiani and Professor Francesco Paolucci, and the collaboration with Bologna Welcome the organization of such important event became possible, proving that Bologna Congressi is the leading player in the meeting industry of the city, with evident perspective of growth, and having some important initiatives and events to be held in the months to come. Such big events, that involve the entire Congress Center – that is to say Palazzo dei Congressi, Sala Maggiore and the Bologna Fiere Halls – are possible thanks to the multifunctionality and flexibility that characterize Bologna Congressi, unique consulting service provider for every stage of event planning and organization.